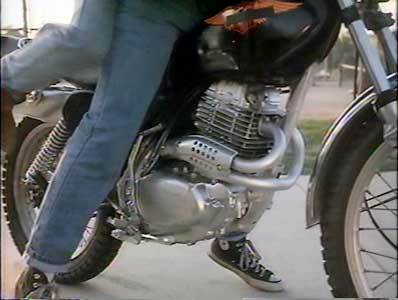 Tom Bresnahan wears black high top Converse “Chuck Taylor” All Stars in the film. Scott and Robin check out the campus of their new high school. Twice Dead is a 1988 horror/slasher film that combines three typical horror flick ideas in an unusual mix. First we have a haunted house story, which involves a 1930s actor named Tyler Walker, a love triangle, and his eventual suicide that sets up the premise for him to be haunting the house. The second storyline is about the Cates family, an All-American type nuclear family moving to a seedy part of Los Angeles from Boulder, Colorado to live in the Walker mansion, which they have inherited from a distant relative. The third plotline revolves around a gang of punks who have been hanging around the mansion, and when the Cates arrive and the cops kick them out, make it their special mission to constantly harrass the Cates’ high school aged son and daughter. The film starts with a flashback to the 1930s where we see the sheriff and the new owner knocking on the front door of the mansion late at night, demanding that Tyler Walker let them in so that they can take possession of the house. We learn that Walker is a down and out actor from the silent era, now facing hard times and having to auction off many of his possessions just to survive. We see Walker holed up in a third story room, dancing with what appears to be his lover, but later turns out to be a mannequin. When the three men finally break into the room, they find the mannequin with a knife in her back and Walker hanging from the rafters. The film then cuts to present day, where we see the Cates family driving to California in their station wagon. There’s the dad Harry (Sam Melville), wife Sylvia (Brooke Bundy), their son Scott (Tom Bresnahan) and daughter Robin, (Jill Whitlow) who is holding the family cat Meow in her lap. They don’t know what to expect at their new home, but are happy to be starting a new life, as Harry has had a number of financial setbacks recently. When they arrive, they are surprised to find a gang of punks hanging out on the front porch, led by Silk (Christopher Burgard). One of the other gang members, Crip (Jonathan Chapin) has an immediate infatuation for Robin which gets both Harry’s and Scott’s hackles up. Luckily the police then arrive, and kick the gang members off the property without further incident. 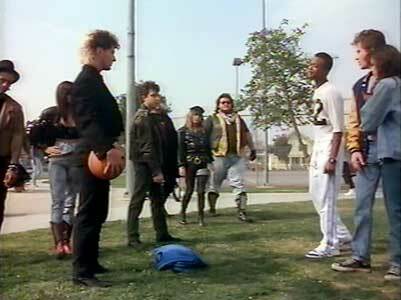 Silk and his gang confront Petie, Scott and Robin over a basketball. The Cate’s first night in the house is quite an experience. They don’t have electricity yet because their deposit check to the power company bounced, and both Scott and Robin see images (yes, it’s the ghost of Tyler Walker) in the mirrors. Scott hears noises in the attic room, and later is threatened in his sleep by the ghost. The next day Scott and Robin walk over to the local high school to check it out. They meet up with Petie (Todd Bridges from “Diff’rent Strokes”) who invites Scott to join him in a pickup basketball game. While they are having some fun playing, Silk and his gang show up and provoke a confrontation by refusing to return their basketball when it bounces off the outdoor court. 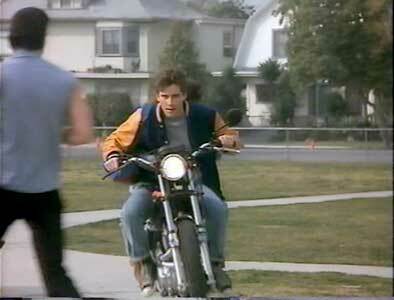 They end up fighting, but Scott cleverly breaks it up by taking one of the gang member’s motorcycle and driving it right into the gang, which allows Petie and his friends to escape. Back at home, Scott and Robin find out that their parents are going to have to return to Boulder to straighten out some legal problems that haven’t yet been resolved. Worried about the gang, Harry insists that Scott take some target practice with his rifle. But Scott and Robin have another solution to the problem of Silk and his gang. Talented in makeup and special effects, they plan a prank for the gang the next time they show up at their house. Unfortunately, this doesn’t resolve the problem — it only escalates it — and gradually the story leads to a final confrontation between the gang members, Scott and Robin, and the ghost of Walker mansion. Scott discovers a dumbwaiter in their house. All the characters in Twice Dead are stereotypes, but they are deftly drawn in broad strokes. As a result, their overall presence in the storyline of the film becomes more satisfying because they are so true to their types. There is a certain “Vincent Price movie” revenge element to the film that makes it a successful horror story in the end. First you have Tom Bresnahan’s Scott and Jill Whitlow’s Robin, so nice and likeable they at first seem like refugees from a 1950s family sitcom. You know that they will be put through a lot of grief. Their father Harry (Sam Melville) could be a poster boy for the NRA: his solution to the gang problem is to break out his shotgun and fire off a few rounds. His antics provide us with some hilarious dialogue. Petie (Tom Bridges), their black friend from the high school, not only plays good basketball, but works at the local library. You know what’s going to happen to him. Then there are the gang members. Silk, their vengeful leader, is so mean and determined to torture the Cates siblings that you know that he will get a special ending. Silk’s two main enforcers are Stony (Shawn Player), who speaks only in swear words and drives his motorcyle inside houses, and Cheeta (Raymond Garcia) who likes hurting people a lot — any more need to be said? And then there is Crip (Jonathan Chapin), who is totally obsessed with Robin, Melvin (Travis McKenna) and Tina (Charlie Spradling) who hang with the gang but are mainly interested in making out. and finally Candy (Joleen Lutz) the one gang member with second thoughts and some normal human emotions. Everything is set up for a great gory ending and Twice Dead doesn’t disappoint. As with most films in this genre, there are a lot of plot holes, technical gaffes, and lack of logic or consistency. But is you like good grade B horror, give this film a look. Scott tries to escape after being handcuffed to a chair by Silk. Scott and Robin escape from the fight on Stony’s motorcycle. Tom Bresnahan in his role as Scott wears black high top chucks in nearly every scene in the film. The cinemaphotography is chucks friendly and you see good shots of Tom wearing them throughout the film. The best chucks scene is when Scott and his friends are attacked by Silk and his gang while playing basketball at the school. Scott grabs Robin and they take off on one of the gang members motorcycle Scott revs the bike up then circles around and drives right into the gang members which allows their friends to escape. Scott and Robin break up the fight by driving right through it. Twice Dead. (1988). Tom Bresnahan, Jill Whitlow, Jonathan Chapin, Christopher Burgard, Sam Melville, Brooke Bundy, Todd Bridges. Written and directed by Bert L. Dragin. Categories: Action/Adventure, Horror.